Stem mastering is a more advanced way of mastering. With this type of online-mastering, you provide us multiple stereo files of your track. Each audio file contains some single or combined elements of your mix. Those files are also called separations, layers or stems. Other types of mastering we provide are stereo mastering and multitrack mixing/mastering. What are the benefits of stem mastering? Stem mastering gives us the opportunity to apply changes to certain elements of the mix without affecting others. For example, with Native Instruments stem mastering, a type of stem mastering, your track is divided into a few busses (stems) so we can apply changes to one bus without affecting the other busses. Let’s take a closer look at this. When you have a vocal track, which has some loud ssss-sounds in the vocal, stem mastering will allow us to process the vocals separately from the rest of the mix. By doing this the de-esser will only affect the vocal part without affecting the rest of the high frequencies of the mix. Let’s assume there is too much sub in the bass line. When having some stems of your track, we can process these signals separately. This way, when having the bass line and bass drum in separate files, we can EQ the bass line without affecting the bass drum. Don’t forget to make a stem file of the mix without the Bass Line, Bass Drum and Vocals. You can name this file as ‘Rest of the Mix’. Including this file, you will have 4 stem files of your mix. Contact us if you need advice on what kind of stems we need from your mix. Please also include a download link to your track so we can have a listen. Decide which elements of your mix you want to use as stem files (or ask us to help you decide). Simply mute the tracks that you don’t want in the stem you are creating. Instead of muting the tracks you don’t want, you can also solo the tracks you want. Make sure your peak levels are somewhere between -12 and -0,1dB. Render you track as .aiff or .wav. The minimum bit depth must be 16 bit, the minimum sample-rate 44.1khz. Import all the stems in your DAW and line them up. Hit playback and listen if the stems are exported correctly. Stem mastering can be handled by our web interface. In step 3 of the web interface, you can mark the stem mastering option. Don’t forget to mention how many layers (stems) you have. The web interface will calculate the costs and will give you a quotation. Press the online mastering button to start mastering your tracks at our studio: mastering your music has never been so easy! Of course, the result of the stem mastering greatly depends on our mastering skills and experience. We have more than 20 years of experience in mastering various types of music. During these years, we have had many satisfied customers. Check the credentials on this page. Also check our discography for a selection of the work we did in the past. Tell us what kind of sound you are looking for or what you feel is missing in the sound of your track. 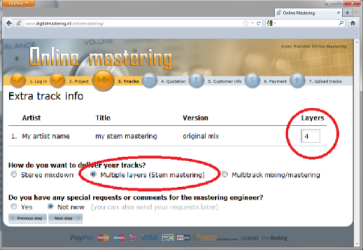 When uploading your tracks for stem mastering, you can place comments using our web interface. Via the private online forum, you can send us a message after uploading and during the mastering. The mastering engineer will read these messages during the mastering. Questions or comments will be placed on this forum too. Upload a reference track along with the track you want us to master using the web interface. The reference track can be a version of the track mastered by you and/or a track you would like us to use as an example for your sound. High quality sounds/samples/synths/recordings are of great importance. The better your mix sounds before mastering, the better the result will be after the mastering. Try a variety of sound systems to listen to your mix. Prepare your song for mastering with great care. Would you like to know more about stem mastering or our other services, for example stereo mastering and multitrack mixing/mastering? Contact us by sending an email to contact@digitalmastering.nl or fill in the contact form.